Hello Instagram lovers! Instagram has started the year with a BANG! It seems like Instagram might not roll out new features to everyone around the world at the same time. 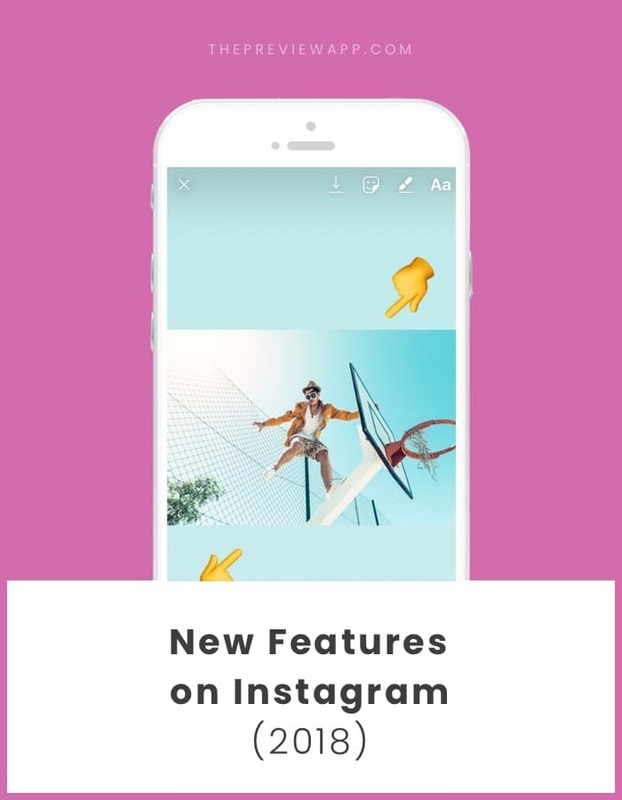 So if you don’t have some of these new features yet, keep an eye on your Instagram updates. Note: Instagram removed the GIFs feature because people found inappropriate ones. The photos you share on Insta Stories don’t have to be full screen anymore. You can resize them! Does it make sense? This is what I do: I place both of my thumbs on each side of the screen and slide them to the center. You will see your photo resize. It works for videos too. This is one of my favorites new feature. You can now follow hashtags. Photos of people who are using the hashtag will pop up in your home feed. It will look like you are following them, even though you’re not. Example: I’m following #ipreview to see what the Preview app community posts. I love that the community comes to my home feed. It’s an amazing way to meet new people. Instagram is testing this new feature at the moment. It’s called “Recommended for you”. Instagram shows you posts you might like based on account you follow. These posts appear in your home feed. It’s another great way to find new accounts and connect with new people. So keep posting! You could be appearing in people’s home feeds. Read: What Happens After you Follow an Instagram Hashtag? This is another awesome new Insta Story feature! Based on all the comments I got on Instagram, you guys love this one the most. Insta Story now has 5 new fonts for your text. The new feature appears on top of your Insta Story screen when you’re adding text. Tip: Press the “camera” icon on the right to add a photo or video behind the background color. To take a photo, press on the middle circle. To record a video, hold your finger pressed on the same circle until you are done recording your video. Release the circle button to stop recording. This is such a cool and creative new feature! I cannot wait to see how people will use it. Stop motion is a series of photos put together. The objects in the photos move. And when you play the photos one after the other it looks like a video. I hope this makes sense. Another Insta Story feature! This one is not a “new” Instagram Story feature of 2018. It began in December 2017. However not everyone has this feature yet. Insta Stories usually last only for 24 hours. Now Instagram allows you to “archive” your Insta Stories. This way, if you feel like sharing them again you can. Even better, you can create an “Insta Story album” (called Highlight) and share it under your bio. A lot of people are getting creative with their Highlights. They create custom “covers” (the image you see in the circle). Not many people know about this new feature because Instagram has not announced it yet. Now you can see when someone is live / online on Instagram or not. And people can also check when you are online. Next time you take a screenshot or screen recording, the person who posted will be able to see. In case you didn’t know, Facebook also has a “Story” feature. It works the same as on Instagram. You can share photos and videos during the day. Now you can share your Insta Story on Facebook Story, automatically. Every time you share an Insta Story on Instagram it will also be shared on Facebook. Press on the “paper plane” icon and select “Add Post to your Story”. Instagram shopping is here! If you have a Facebook business page or catalog, and an Instagram business page, you’ll be able to sell products on Instagram. And if you want to shop, you’ll just have to press the “Shop” button. You can now add hashtags and usernames in your bio. They will be clickable. They will bring you to a hashtag page or another Instagram profile. Note: When you mention someone else’s profile in your bio, they will receive a notification and can choose to remove the link to their profile. Their profile will remain in your bio but without a link. Another cool new feature on Insta Story: “Focus”. It will blur out the background of your photo. This is especially cool if you’re taking a selfie. It will make your photo look like it was taken with a professional camera. Is the Instagram home feed becoming chronological again? There will be a new button on top of your home feed called “New Posts”. When you press it it will load new posts from the people you’re following. This means that you will see the most recent posts. We don’t know yet if the posts will still show up based on our activity on Instagram (posts we interact with = posts we see in our feed). It looks like it might be a mix of our current home feed (based on our activity on Instagram) and this new home feed with the button. We’ll let you know when we hear more news. That’s it for now. I will add more new features to the list when Instagram releases new features. So feel free to save this article somewhere if you want to stay up-to-date. And as always, let me know in the comments if you have any questions.